We've factchecked claims from Prime Minister's Questions on all things NHS, as well as the armed forces covenant, housing benefit and adoption figures. The post The NHS, the military covenant and adoptions: factchecking Prime Minister’s Questions appeared first on Full Fact. GDP figures are our main indicator of economic growth. What is GDP? How is it calculated, and why is it so often revised after the fact? The post GDP figures explained appeared first on Full Fact. The European Union, like all public bodies, attracts regular criticism over how it uses public funds. Sometimes, the criticism comes from within. The European Court of Auditors (ECA) is an EU body set up to examine the accounts of the Union. In 2013, the ECA found that 4.7% of the €149 billion spent by the EU wasn't spent according to the rules. What would this €7 billion have paid for? The post Did the EU misspend enough money to build 10 new hospitals? appeared first on Full Fact. Response to "Breastfed children have higher level of toxic chemicals"
A legal case on parental fines for taking children out of school for holidays wasn't the landmark it was reported to be last month—but might turn out to be. The post “Holiday fines” case heads to High Court appeared first on Full Fact. As humans, the concept of parenting and care giving is often ingrained so far into our lives that it is easy to take it for granted. On a recent visit to the zoo, my two-year-old recently asked, “but where’s the tortoise’s mummy?” She made the quite reasonable assumption that all animals come in nuclear families, and are just as committed parents as are most of us humans. Perhaps we take parental care for granted because we are mammals, and every mammal species cares for offspring – at least to some extent. But aside from us mammals, most species – including almost all tortoises – actually abandon their offspring as soon as they can, making species that actually parent a tiny minority. Especially species like us, where dads are typically involved as well as mums. Another group where most parents usually abandon their eggs immediately is the arthropods – a large group including insects, spiders, crustaceans and many others. But of the arthropod species that do care for their offspring, some are among nature’s most devoted parents. And our new study shows that this parental care often evolves because of the risk of predators. Parental arthropods have long fascinated generations of scientists, and as early as 1764, the Swedish naturalist Adolph Modeer patiently watched a tiny – but very brave – “parent bug” stand over its offspring and challenge attackers instead of fleeing. Others take parenting behaviour to extremes – such as some female spiders, who allow their babies to eat them. These mothers only ever have one brood of offspring, so technically they have nothing to lose – why let your nutritious corpse go to waste? And research has shown that by eating mum, spider babies actually grow to be bigger adults. This gives them a kickstart that boosts their chances of reproduction compared to those babies that are lumbered with more stingy, non-suicidal parents. Compared to suicidal spider mothers though, most arthropods that provide childcare are slightly less gung-ho about it. But they can still help to boost their babies’ survival prospects. Bromeliad crabs, for instance, lay eggs in rainwater pools formed in the spiral or “rosette” of rain-forest plants. The mother crab patiently drops snail shells into the water, which elevates calcium levels just enough for the baby crabs to form their tiny shells. An obvious question then is why only some – and not all – arthropods care for their offspring. And one longstanding idea is that care evolves in places where undefended offspring are more vulnerable to predators. The great biologist E.O. Wilson suggested that we could test this idea by looking at where the parent and offspring happen to be living. This is because insect predators are cold blooded – and their level of activity depends on temperature. So the hotter it is, the more active they are – and so the more intense the risk from predation tends to be. 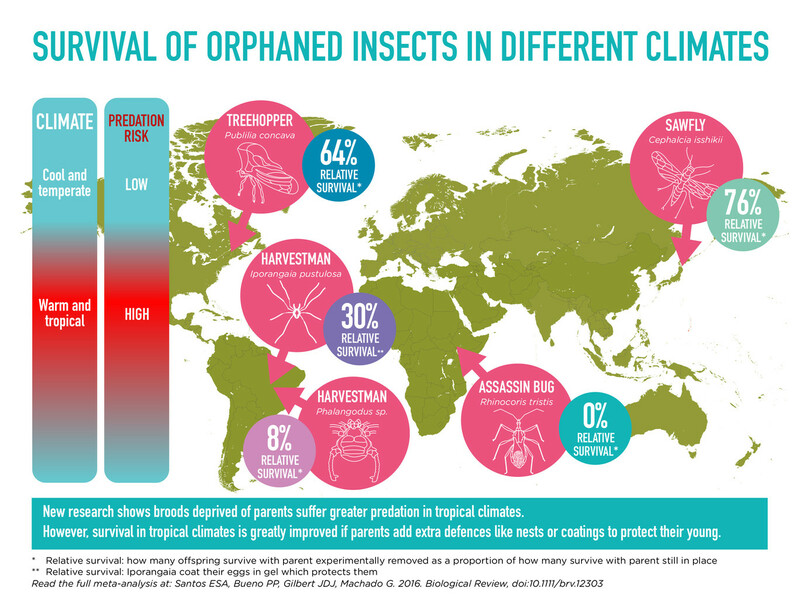 Based on this idea, it would stand to reason that leaving offspring unattended in the tropics would be more risky – because unattended offspring would encounter more predators in the tropics than offspring in cooler, drier environments. This idea is simple and intuitive, but it has gone untested for over 40 years. Over the years, many insect studies have involved removing the parent to observe what happens to the offspring. This allows scientists to see the difference in survival between experimental groups without a parent, and control groups with a parent. This difference can be interpreted as the benefit of parental care. In some species, broods are entirely destroyed by predators when parents are removed. Others incur more minor losses. In at least one case, offspring actually survive better without their parents. 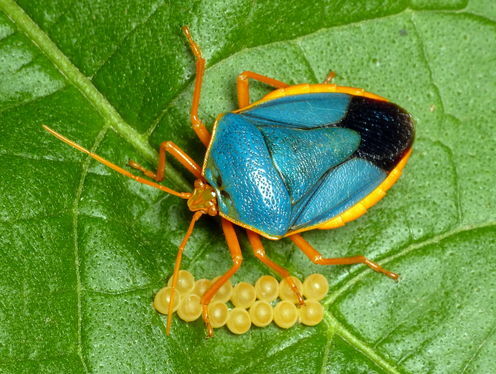 Despite their best efforts at defence, females of one particular species of stink bug actually attract “parasitoid wasps” – rogue insect robbers that hijack and consume eggs and larvae. The mother bugs act as signposts for wasps who might otherwise have passed over the eggs without noticing. In our study, we analysed data from many of those removal experiments conducted over the years, to find out whether – as Wilson suggested – the benefits of care are greater in the tropics. The results showed that almost all the control groups – the ones that hadn’t had the parents removed – survived better than the removal groups who were left to fend for themselves. Critically, the culprits were almost always predatory insects, mostly ants. This shows that parental care is generally an effective defence against predators. And, as we predicted, the effect of removing parents tended to be greater in tropical locations than in cooler, drier climates – finally confirming Wilson’s hypothesis. But this was only the case in species whose eggs are completely undefended without their parents. For species who also have a back-up defence – such as nests, burrows, or eggs covered in mucus – eggs in the tropics fared no worse than eggs in cooler locations, once parents were removed. This shows that there are other strategies open to arthropod mothers for keeping offspring safe as well as physically guarding them. And in the tropics, where parental care may not always be enough, mothers may well need several lines of defence against predators. James Gilbert has previously received funding from the European Commission’s Seventh Framework Programme. Peter Sutherland of the UN is right that the UK receives fewer asylum seekers than other EU countries, but not as few as BBC listeners were led to believe. The post UN wrong on asylum seekers in Britain appeared first on Full Fact. The post The UK and the EU’s asylum policy appeared first on Full Fact. The post Zero reasons to compare zero hours contracts over time appeared first on Full Fact. The post Lord Neuberger unveiled? appeared first on Full Fact. How many young people could benefit from Help-to-Rent? The post How many young people could benefit from Help-to-Rent? appeared first on Full Fact. The post 3 million jobs “linked” to trade with the EU appeared first on Full Fact. The governor of Bungoma county said he had ordered a market survey of the price of stainless steel wheelbarrows after the county bought 10 for more than KSh1 million. Not to worry, governor Ken Lusaka, Africa Check did it for you. The post Taken for a ride? Kenyan county paid too much for US$1,000 wheelbarrows appeared first on Africa Check. FactCheck: do the Conservatives give young people the best start?